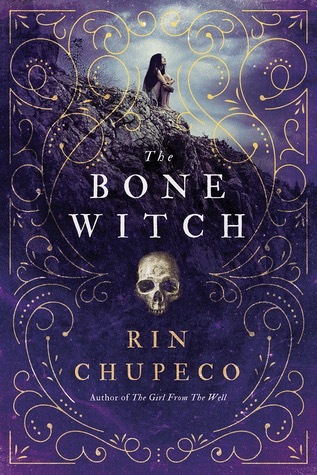 I had really high expectations for Rin Chupeco’s The Bone Witch, especially because the publisher said it was for fans of Leigh Bardugo and Sabaa Tahir. The comparison is fair – these authors offer fantasy with diverse cultures and exotic settings. They all feature magical elements and female protagonists who find themselves outside of their comfort zone in battles they never asked to fight. My problem is that those comparisons lead me to expect a lot of action in The Bone Witch, and when it didn’t deliver, I was disappointed. That is a real disservice to this book, though. The Bone Witch has a lot to offer fantasy readers, and it is a solid four star read if you go into it with the right mindset. This is a beautifully detailed book that develops a strong narrative voice and a rich culture and setting. There is an elaborate way of life that readers must come to understand in order to see what the narrator is up against, but that takes a lot of time to establish. If you are looking for more action, it is likely you will grow impatient with the minutiae of Tea’s life and training. Readers who pick this up with clear expectations that this book is building to what I believe will be an epic battle in the next book will fare better. I was particularly interested in the dual narrative – the author alternates between Tea in the present and Tea in the past. I liked how that built a lot of suspense, and I thought it was an interesting way to break up the monotony of dancing, combat lessons, and detailed clothing descriptions. I found the ending very intriguing, so I’m pretty sure I will pick up the next book, and hope that all the heavy lifting is done and we can advance to some pretty fierce action. The exotic setting and the necromancy will interest many of my high school readers, but I question how many of them would stick it out, so I would recommend it to readers who have the patience to let a story build over those who want girls hacking away with swords every second (not knocking that, since usually I’m that reader). Language and situations are appropriate for grades 7+.